Originally from Vancouver, Mecca Menard began her violin studies at the age of 6 with Nicki Stieda at the Vancouver Academy of Music. She later continued her musical studies with esteemed pedagogue Professor Taras Gabora. Mecca holds a Masters degree in Violin Performance from The Shepherd School of Music at Rice University where she studied with Professor Kenneth Goldsmith with the Margaret and Emory Carl Endowed Scholarship in Music. She completed her Bachelor of Music Performance at McGill University as a student of Denise Lupien and Jonathan Crow and was a recipient of the Lloyd Carr Harris String Scholarship. 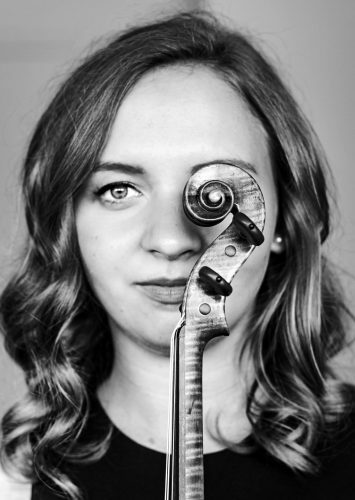 An avid chamber and orchestral musician, Mecca has performed throughout North America and Europe and has attended numerous festivals including Orford Arts Centre Academy, Domaine Forget, Toronto Summer Music Festival, The National Youth Orchestra of Canada and the Casalmaggiore International Music Festival. She has had the privilege of performing in masterclasses with renowned artists and pedagogues including James Ehnes, Regis Pasquier, Norman Fischer, the New Orford Quartet and the Pacifica Quartet. A passionate music educator, Mecca is a dedicated teacher of young violinists and is excited to be part of the faculty at VAM.